A recent Pew Research Center report titled “More Millennials Living with Family Despite Improved Job Market,” which touches on apartment demographics, found that fewer households are headed by 18-34 year-olds (millennials) now than 10 years ago. This, despite a decrease in the unemployment rate for this age cohort and an increase in the group’s population. The headline unemployment rate (U3) for 18-34 year-olds fell from a peak of 12.4% in 2010 to less than 8% in 2015. Meanwhile, the population in this cohort not enrolled in college grew by 5.4 million from 2005-2014. To be fair, the 18-34 age group of 10 years ago contained about half as many millennials as now, because the oldest millennials are just turning 34 or 35 this year. In 2005, this smaller age cohort included a large portion of Generation X, the generation between baby boomers and millennials. The generally weak economic recovery from the Great Recession, which has not created the right types of jobs that would spur household creation for this population. Student debt, weak credit and, perhaps, a lack of “push” from helicopter parents — who may be more tolerant of stay-at-home young adults than previous generations – also could be factors. The following chart illustrates the diverging trends in total (owner and renter) households headed by younger people and the raw increase in population for this group. The Pew report states that both the number of young adults living with their parents or “doubled up” with one or more roommates has increased steadily since 2007. Since 2005, the non-student population of 18-34 year-olds has increased from 55.9 million to 61.3 million, while the number of households headed by this age group has fallen from 24.4 million to 22.3 million. This group of young adults is poised to enter the market in the (hopefully) near future, creating a pool of pent-up demand. This age cohort is also the group most likely to rent an apartment, putting even more pressure on the current pace of escalating rents. In addition, the growing population of young adults who have not created their own households has stunted demand for household furnishings, appliances, cable and satellite hook-ups, and other purchases that home buyers and first-time renters obtain. 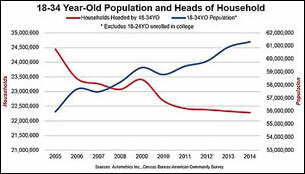 The economy will certainly benefit if and when these young people move out on their own. 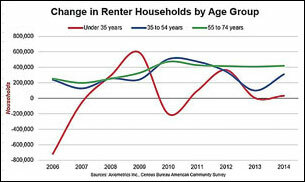 What does all this mean for the demographics of the apartment market? A lot has been written about millennials’ propensity to rent an apartment rather than purchase a home, and how that helps spur the high demand for apartments in many metro areas. This demand has been responsible for tight vacancy rates and high rent-growth figures in these markets. In fact, according to the Axiometrics August Market Trends Report, national annual effective rent growth exceeded 5% for the seventh straight month and national occupancy exceeded 95% for the sixth consecutive month. Both of these metrics are records. The homeownership rate by age cohort gets progressively higher as householders tend to gravitate toward homeownership over time. But if millennials are delaying not only homeownership, but household creation of either type, who is providing the apartment demand that has kept vacancy rates low and rent growth high around the country? The change in renter households by age group in the chart below reveals that baby boomers and empty-nesters have increasingly preferred renting. The 55- to 74-year-old age cohort has created an average of 355,000 renter households per year from 2006-2014. This figure includes single-family, townhome and condo rentals and includes homeowners who lost their houses to foreclosure after the housing bubble burst. Surprisingly, the 35- to 44-year-old age group – the group that comprises the majority of homebuyers as they marry and have children – actually had the next-highest rate of rental-household creation, averaging about 288,000 per year from 2006-2014. Again, foreclosures and rental lifestyle choices play a part in this figure. Millennials certainly are a large part of the current apartment growth cycle, as they outnumber the ages 55-74 renter-household total almost 2-1. But the increase in rental households headed by 18- to 34-year-olds increased by an annual average of only 44,000 since 2006. It’s also worth noting that part of the reason for high rent growth and low vacancy rates around the country is the result of a shortfall in multifamily units built because of the Great Recession, as discussed in our May Permitting Report and a subsequent blog post. More than 500,000 multifamily units were not built from 2009-2013 than would have been had the annual average from 1995-2008 prevailed and the recession not occurred. If millennials were creating households at the rate that would normally be expected based on their population and given the existing shortfall of inventory, rent growth would be even higher and vacancies tighter with increased demand. It appears this slower household formation for millennials is just right for right now. Chuck Ehmann is a Real Estate Economist for Axiometrics. He provides research, analysis and insight into the economic, demographic and financial trends affecting the multifamily industry. Axiometrics: Axiometrics’ specialty is monitoring the apartment and student housing markets, providing an in-depth view of volatile market trends. Axiometrics’ granular data-collection methods and enlightening analysis help clients make profitable – and intelligent – decisions. To learn more visit www.axiometrics.com, follow @ Axiometrics or on LinkedIn, or call 214-953-2242.